A Study in Lavender by Joseph R. G. DeMarco, editor, a Mysterious Review. 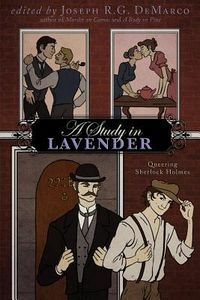 Review: Though subtitled "The Queering of Sherlock Holmes", A Study in Lavender, a decidedly eclectic anthology of gay-themed short stories edited by Joseph R. G. DeMarco, does not feature the famous consulting detective or Dr. John Watson in every tale, but does take inspiration from them in crafting the plots. Eleven stories are presented here. Most take the form originated by Sir Arthur Conan Doyle, with Dr. Watson narrating an adventure that involves Holmes and in which he, too, plays a part. And, despite the subtitle, the majority of them do not portray Holmes or Watson as lovers, or even openly gay, though broad hints are dropped in a few. In some cases, the topic is irrelevant, but that's almost certainly the point, to illustrate that whether or not Holmes and/or Watson are gay doesn't matter to the client or the outcome. The most satisfying stories mimic those of canon, with Holmes being presented with a problem that promises to be interesting — and his definition of "interesting" is always open to debate — and in which he proceeds to solve it. "The Kidnapping of Alice Braddon" by Katie Raynes and "The Adventure of the Hidden Lane" by Lyn C. A. Gardner are typical of these, seemingly familiar stories but ones with a twist. A couple are interesting but lose some of their impact by being far too long. At over 70 pages, for example, "The Well-Educated Young Man" by William P. Coleman, an otherwise solidly plotted story, could easily have been trimmed by half. A few of these stories, however, do not follow the standard, and these are probably the weakest of the lot. Not so much from the stories per se, but in how they fail to distinguish themselves apart from what might otherwise be expected. "The Case of the Wounded Heart" by Rajan Kharma, for example, doesn't feature either Holmes or Watson, but is a third-person story about Inspector Lestrade. Though he appears in some dozen or so of the original canon, he's not a terribly memorable character … and even less so in this story. White out the name "Lestrade" and one would be hard pressed to guess who the central character is. In another, "The Bride and the Bachelors" by Vincent Kovar, the story is narrated in first person by Holmes. The problem here is that it is told in the same manner and style as Watson would tell it; in other words, it's virtually impossible to distinguish between Holmes's voice and that of Watson, and therefore, what's the point in making the switch? Still and all, most fans of Sherlock Holmes, especially those that read or collect beyond the canon, will take an interest in the stories here. They're meant to be a serious extension to, or in some cases reinterpretation of, the characters created by Doyle … and for the most part, one that is successfully achieved. Acknowledgment: Lethe Press provided a copy of A Study in Lavender for this review.